As I write this, The Bard's Tale IV has attracted nearly $200,000 more than its $1,250,000 target, so it's a safe bet the game will be made. 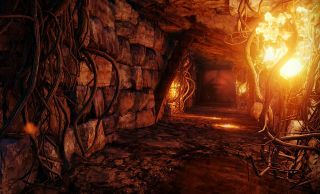 InXile is currently in the early stages of development, with a lot of the focus on world design. It makes sense that you'd start from there, and as the video above demonstrates, the studio has made some solid progress. I'm no game designer, so it's especially fascinating to witness some of the asset creation. The studio photographs a real tombstone and manages to render it digitally in-engine, lending an air of authenticity to the ancient Scottish ruins you'll be exploring in the game. The Kickstarter still has a couple of days to go, but it's still well short of the Chris Avellone $1.9 million stretch goal. For more in-engine footage, cast your eyes over this earlier trailer.